Hi everyone! I’m Patrick, game programmer on Team Omni. 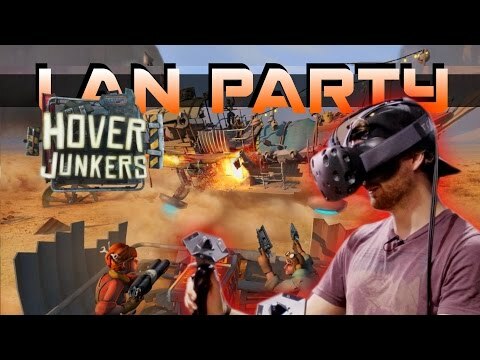 I worked on making the game mechanics and optimization of Training Ops including turrets, weapons, and, what I think is most interesting, player input from the Omni and Vive. Given our recent announcement and video of Vive support, I’m going to focus on the new features this lets us utilize in Training Ops and future projects. Supporting the HTC Vive enhances our gameplay immensely. Previously, the combination of an Oculus DK2 and an Xbox gun controller required you to look where you wanted to aim; the gun was attached to your face inside VR like most standard first person shooters. With the Vive, we use the power of their tracked controllers to have player weapons completely decoupled from their face. You no longer have to look where you want to aim. The weapons are floating out in space where your hands are. Additionally, when Oculus’ next version of their headset comes out with tracked hand controllers as well, we hope to support them too. Immediately after implementing the Vive, I noticed two things players needed. First, the rifle we normally have in Training Ops is not ideal for holding two controllers. I tried a variation of the rifle by having it attached to one controller and it would constantly look at where the other controller was located, but the effect just wasn’t there yet. From in-house testing, everyone wanted dual wielding. It made sense. You have two controllers in your hands, players want to be able to walk down a hallway, arms outstretched to either side shooting in both directions. So, I gave them what they wanted. I added pistols and everyone had a blast. But I said there were two things I noticed players needed. The second thing was that the game was incredibly difficult now. 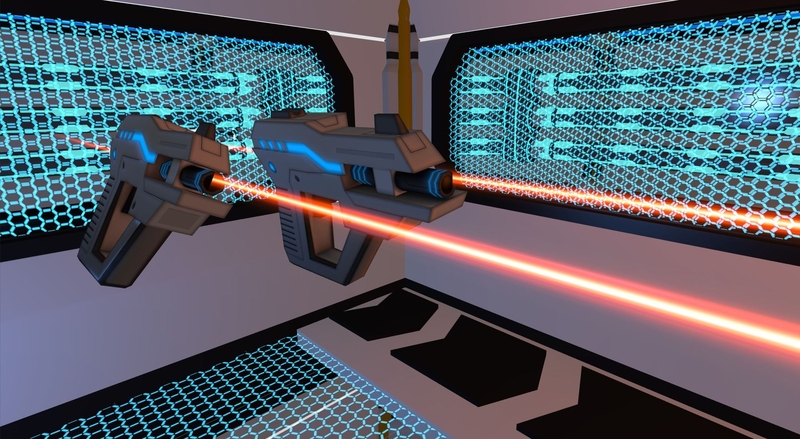 Players are used to standard first person shooters where the direction the gun is shooting is from the center of the screen (where the reticule is). Now, the guns are shooting more so like real guns with projectiles firing from the ends of their barrels. Additionally, there is no longer any iron sights button. If a player was to aim down the sights they have to physically move the hand controller up to their eye in order to look down the sights. So, I started adding some assistance while still trying to keep the challenge present and ensuring the player still felt powerful. The end result was large red laser sights that the player can easily line up with targets to quickly take them down while moving quickly on the Omni combined with large projectiles that can be easily followed so players can determine where the projectile hit and how to adjust their aim to their target. The effect was very well received and everyone was charging through the levels of Training Ops with huge smiles on their face. I hope you get a chance to experience Training Ops with pistols, and keep following for more updates from us on the Game Content team. Outstanding! I was really hoping you would get a Vive dev kit. This looks absolutely amazing. Can you turn off the laser pointers? For those that want an extra challenge? Absolutely! Currently for demoing we have a keyboard shortcut to toggle through laser sight options, but it may make it into a gameplay options menu for release. Without lasers makes gameplay very hard, but rewarding. I felt really accomplished running through a level with no laser sights and getting 70-80% accuracy. When people choose to go without laser sights they tend to choose to use only one pistol as two pistols is hilariously inaccurate. Awsome. I can't wait to get this! Amazing stuff, really really groundbreaking. Correct me if I'm wrong, but you are probably the first person in the world to create a VR game with two pistols like this. Must be really thrilling to be a pioneer like that. The history of these games will be rooted at you! Heady stuff. Question .. if you turn off the laser sighting and fire, it may (or may not) be cool to have some kind of burn effect on the walls where you miss so you can adjust based on that. Also, in the video I noticed you seem to go "through" something that was attached to the walls. ~21s in the video. I personally find going through anything like a ghost in VR very nausea inducing. Just some personal feedback. Maybe something to encourage the player to not drag along the walls? Maybe slow them down? I dunno. Just random thoughts. I really hope mods for fallout 4 come out to enable stuff like this. Can you imagine? Or maybe dual swords in skyrim mod!! Man, exciting times. People who don't see the potential of active VR are so incredibly short sighted. In my opinion, they should just go play augmented reality games. No worries though, as soon as this is out and people are playing this game the envy will start to appear and ever one will want an omni. -There is currently an impact effect for pistol projectiles which I feel is more-noticable in VR, but a lingering burning/electrical effect may be cool. -The walking through the hinge irked me to; we are still working on polishing the levels but we really wanted to push a video out to you guys in spite of small issues like this. -Walking through the wasteland with dual pistols would be incredible, but I think that is unfortunately out of reach. I have no doubt the community will achieve a dual-wielding mod, but decoupling the arms from the camera will be a massive feat that I think has a lot of technical challenges. I don't have too much experience with Bethesda's Creation Kit so I can't specifically judge the technical challenges and limitations of bringing VR to it. Very cool. YEah, I guess the next huge feature of course is multiplayer.